The highly regarded 3 Hammers Golf Complex has become a hugely popular venue for golfers, receiving awards and adulation, and it has now been recognised further after joining England Golf's Affiliation Programme. 3 Hammers, situated just off the M54 near Wolverhampton, is a thriving, innovative centre which has introduced 20,000 adults to golf in the last four years alone. It’s the first stand-alone golf centre to affiliate since England Golf recently extended the opportunity to short courses and ranges, as well as golf clubs. The move recognises that people play golf in different ways and at different venues and that all should be offered the same support. Affiliation offers wide-ranging benefits, including the chance to make use of England Golf’s extensive business support and to achieve the new SafeGolf accreditation, demonstrating a commitment to safeguarding children and young people. Complex owner Ian Bonser said: “We’re delighted to have the opportunity to affiliate. It means we can take advantage of all England Golf can offer to help us become even more successful in attracting new golfers and keeping them playing. 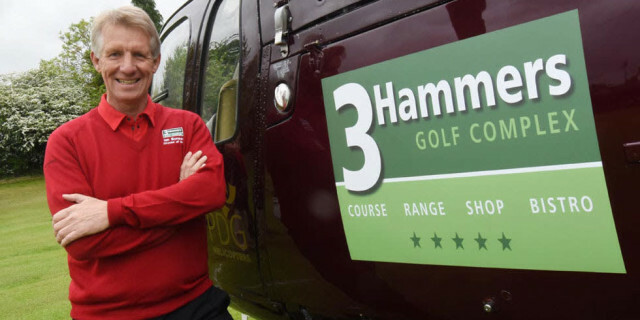 “3 Hammers continues to go from strength to strength and with the additional backing of England Golf we're looking forward to an exciting and prosperous 2019." The centre has an 18-hole short course, a 20-bay driving range with the latest Toptracer technology and a very busy academy of six PGA professionals offering a wide range of tuition. It successfully launched a women’s programme, Ladies Love Golf, and it’s working on a new programme for boys: Lads, Lads, Lads. Over the last four years, as well as attracting 20,000 adults, the centre has introduced 4000 young people to golf and created links with 13 clubs in Shropshire and Staffordshire. In the New Year, 3 Hammers plans links with the Stroke Association, British Heart Foundation and Prostate Cancer UK to promote health benefits to their customers. Around 1900 golf clubs are already affiliated to England Golf and the decision to extend this opportunity to ranges and short courses was made earlier this year. To find out more about affiliation opportunities please email [email protected].